Stencil leaves/berries on card base – one color per each of the four stencils. Die cut flowers, leaves & sentiment. Adhere flowers and leaves to corners, to create floral clusters. CLICK HERE to view our live broadcast from Cincinnati! Now it’s your turn! Create a project using 8 colors and involving stenciling, stamping, and die cutting. You can choose to re-create the exact project from Dawn above or design your own using the same concepts. Your project must also incorporate at least one Papertrey product. You will have until 7am ET, Thursday, August 30th, to add your link to the list to be eligible to win. One project per person please. One randomly selected winners will be chosen from all of the InLinkz entries on this post on Thursday, August 30th. The winner will be posted on our Stamp-A-Faire 2018 Winners Page after 9pm ET on Thursday night . The randomly selected winner will get a $20 PTI gift certificate to spend however they like! One randomly selected winner will be chosen from the comments of this post on Thursday as well. You will have until 7am ET, Thursday, August 3oth to add your comment and be eligible to win. The randomly selected winner will get a $10 PTI gift certificate. I really love the layered flowers in those bright colors. Haven’t been able to view the video but love the still photos. Love the bright colors. I’m loving the online participation today. Thanks for the clear instruction and helpful hints for substituting what I already have in my stash. That really boosts my creativity! I especially appreciate your challenge to use 8 colors on the card. Finally, I hope the You’re the Best die will be available at some point in the future! These are beautiful dies. Love the sentiment die & looking forward to seeing the challenge entries. I really appreciated Dawn talking directly to those of us watching from home. All of those hours watching the Food Network paid off for Dawn and us! And I really love the sentiment die and would be excited to see it pop up in the store. I really like the use of the leaf stencils along with stamping and the die cut flowers. The sentiment is awesome also! Thank you for the great video and for sharing your beautiful creations, Dawn McVey! Beautiful bright Dawn colors! Fun to watch everyone having fun! Will the fun Papertrey Ink aprons ever be available for purchase? Would be perfect for crafting & I’d for sure buy one! It’s really great to see Dawn and her beautiful bright cards. Love her bold colors. Such beautiful creations. Dawn is so talented. Gorgeous card…love all the bright beautiful colors. Dawn, your flower cards are always gorgeous! Wish I could have been there to attend your class in person. 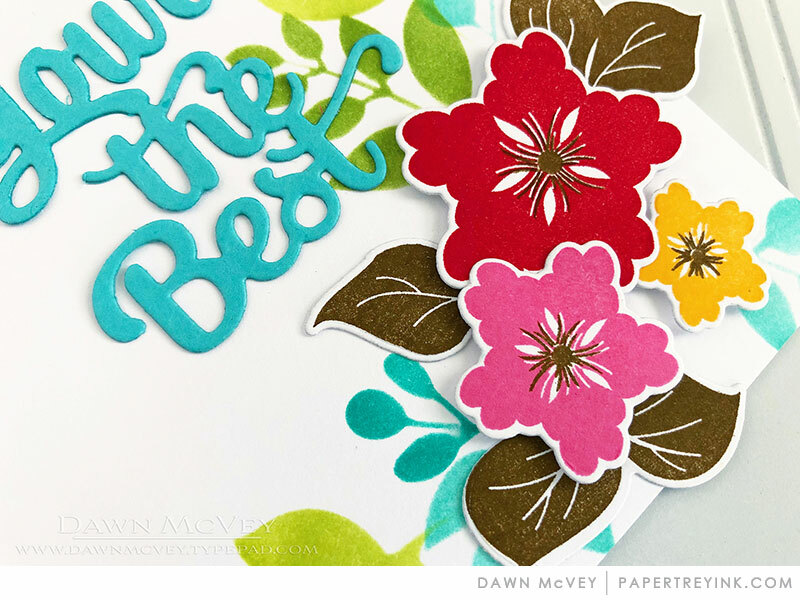 Love your colorful flowers, Dawn, and the stenciled leave are a nice touch! Love the look of stenciled leaves added to the colorful floral arrangements, Dawn! Your sentiment really pops! Thanks a million Dawn for a super time. You did an amazing job. Love the cheery colors and the great sentiment! So happy to see Dawn able to participate! I don’t see a video, but maybe it will be there later. Anyway, Dawn’s card is so cheerful & beautiful–a fun challenge! Enjoyed the challenge to use at least 8 ink colors. This might be Dawns best floral…it has a lot of competition. It is gorgeous. She did an amazing job teaching the class. So good to have her back. Oh, I love Dawn’s bright, colorful style! I like the idea of the different layers with different techniques. I like the font for the “You’re The Best” die. Your project would bring a smile to everyone! Love your work. Very pretty. Love this stamp set (but I don’t have it). Just adorable and so “happy” feeling. What a pretty, cheery and colorful card, Dawn! It was fun watching you make it LIVE and to get your tips on how to put it all together. Thanks for your inspiration. Great job! Very pretty card! Eight colours is a challenge for sure! So great to see Dawn and I just love the way this card turned out. I appreciated the way Dawn included those of us at home during the live feed. I don’t usually use this many bright bold colors so it was great to be challenged to move outside my comfort zone. Wonderfully inspiring! Love this card with all the layers and techniques. Can’t wait to try it! Such a cheerful card – love the layers! So glad to see you were able to attend & are feeling better! I need to remember to break away from the norm & use more color on my cards in the future. Love the mix of colors & different layers. Great idea! Love seeing you on camera, Dawn. You look fabulous! Loved seeing everyone’s contributions who posted their own cards. It is wonderful to see Dawn creating with her beautiful, vibrant color schemes. So happy she is back! Such a great challenge that could create so many pretty variations! Love the stencils for leaves! I can see using them over and over! Thank you Dawn! Dawn your card is Gorgeous! And so are all others that have been made! Awe inspiring! Next year I am going to be joining and trying to participate in at least one of the challenges! So beautiful- I always love your bright and cheerful cards Dawn! 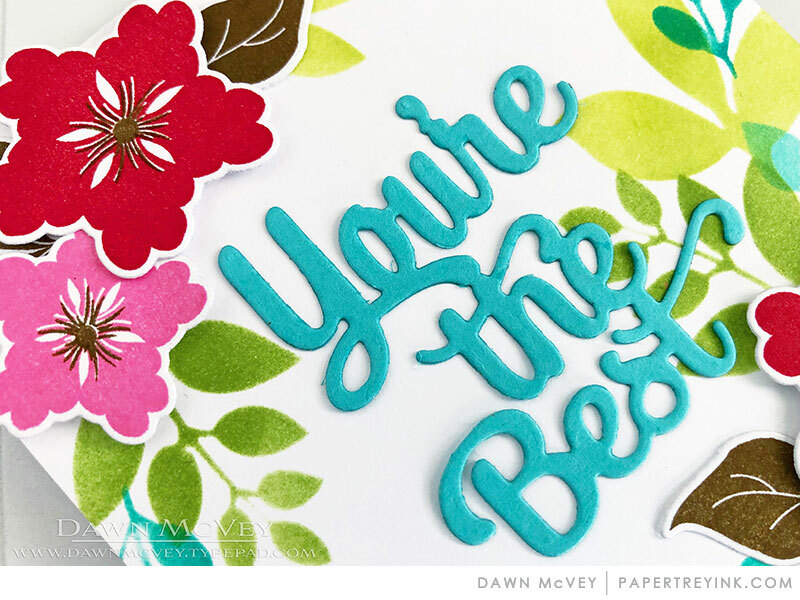 Dawn is a whiz at mixing vibrant colors to create cards that make the recipient smile! Dawn – love the stencils, this is something lacking in my crafting collection, so I was excited about this project! What a fun card! Loved using the stencils! Watching the live video was awesome! Was great to see you and hear all of your tricks and tips for putting it together! Enjoyed all of the interaction at the table during the video. Stamp a faire was incredible! Thanks! Love this style of card that combines so much color, stamped die cuts, flowers and a large sentiment. The design and wonderful colour combinations on your card make it a real stand out, Dawn! Thanks so much for the wonderful inspiration and handy hints to ensure our success! So to see Dawn “live and in person” even though I was at home. You look great. Your card was beautifully planned out as always and the colors are so cheery. That card would brighten anyone’s day. I love the colors we used for this class. The images on the stamps are really fun to use, and I love the layering stencils. Stamped flowers, stenciled flowers, die-cut flowers, flowers morning, noon and night. They are the perfect design element. Brown leaves… only Dawn, and they’re gorgeous! I look forward to trying other non-traditional colors. Hugs to my now not so imaginary friend Dawn!! Great project! I love how happy this looks! This would brighten any day! What a beautiful and colorful card! Such a colorful happy card!! Wonderful card- bright and beautiful! This card is almost as bright and sunshiny as you, Dawn! Thanks for an awesome class! 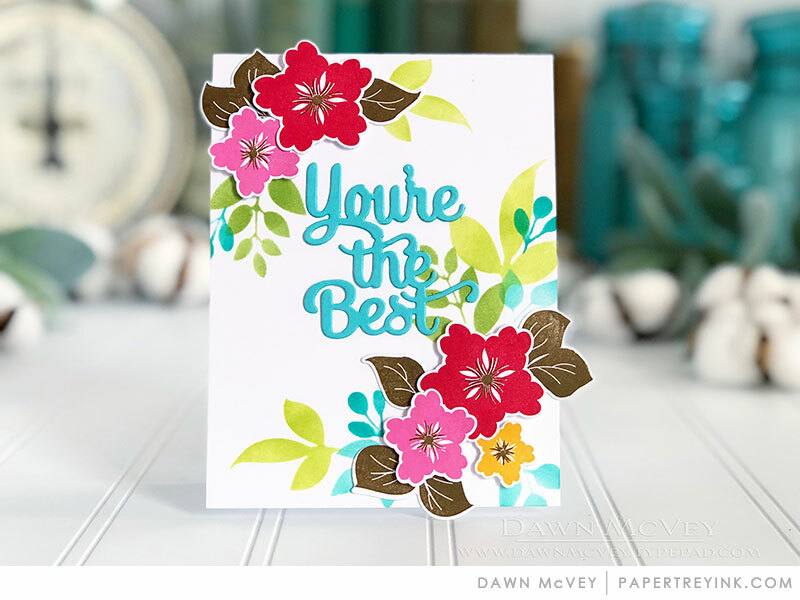 Always love Dawn’s cards and her bright, cheerful colors she uses! What a beautiful card! Love the bright colors. Such a pretty card! I love the leaf stencil idea … quick, easy, and fabulous!! This was fun, and a stretch to use so many colors/textures on one card.